Who was "Little William" and why did someone inscribe a short, sad tale of his life on the dam at Squaw Tank? Did he ever even exist, or was the epitaph left as a hoax? Who wrote it and when was it written? Like many things in Joshua Tree National Park, it's a mystery. Can you see the inscription? The next time you visit Squaw Tank (stop #9 on the Geology Tour Road), walk right up and take a close look at the front of the dam. It's hard to spot even when you know it's there, somewhere. I didn't see it the first time I looked for it, so I got in contact with the owner of the website where I originally learned of the inscription. He gave me a couple hints where to look and on my next trip, I found it. You can visit his Little Willie webpage, HERE. It's definitely intriguing and yet another fine example of the amazing things you can find at J Tree within a couple hundred yards of a parking area. The true story about the inscription will most likely never be known, but that's not a bad thing overall. It's just another addition to the JTNP Mystery List, which continues to grow each time I visit the park. 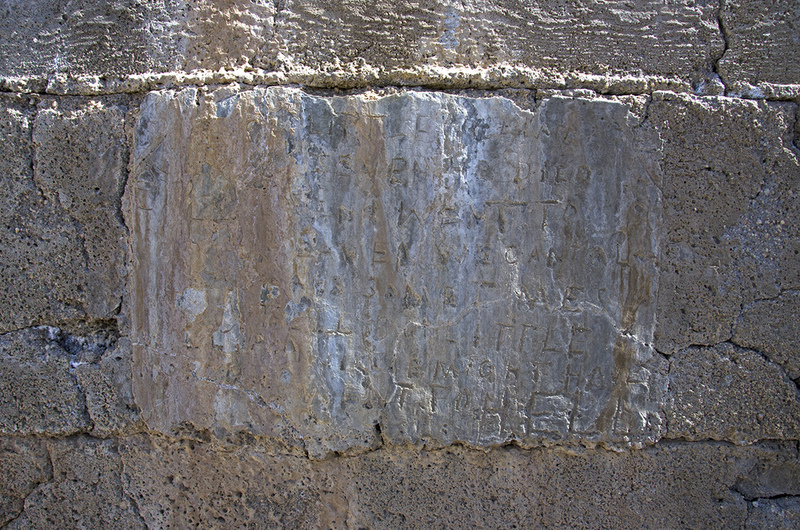 It also appears that on the left side of the inscription, a stick figure of a child holding a bucket was at one time more plainly visible. Not knowing how long this has been here, it's hard to guess how much longer this verse will remain visible, before the heat, wind and rain eventually blast it away. Here's an unrelated photo, but I thought I would throw it in. Malapai Hill, just on the other side of the road.